I LOVE your golden/yellow Aenur! Excellent stuff, Pancreasboy! Those elves are great - and I think I see a few classic GW models in there as well. Really nice. Aenur and the Blind Guy (can't remember his name) are beautifully done. 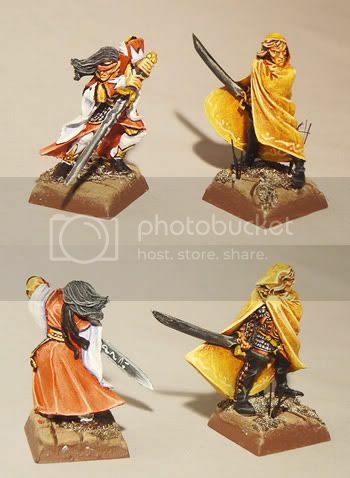 I have those two models as well, and plan to use them at the heart of a Shadow Warriors warband. I've always been pretty happy with the paint jobs on both, but having seen yours, I realize that they're not nearly as good as I had thought! Still, these models are inspiring - fantastic work! And yes, the green edges to the bases don't look nearly as good as GW thought they looked at the time! Happy to hear that you repainted them! Happy to hear that you repainted them! 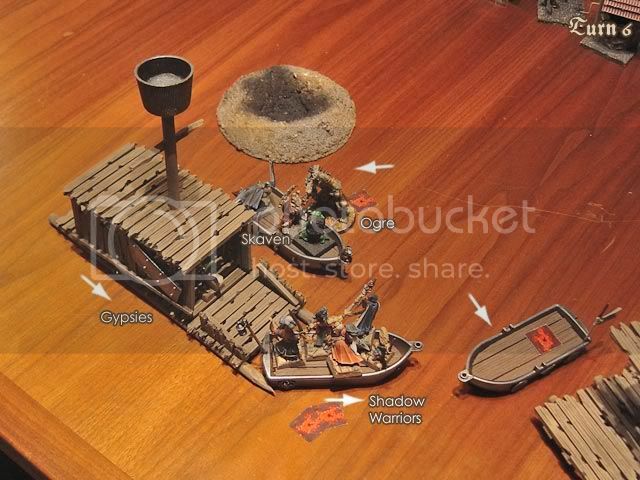 Wait, those boats look strangely familiar.. are they LEGO? Hehe yes. www.bricklink.com is a must! I'm DELIGHTED to hear [ ] that you escaped the McVey Green Base Syndrome. 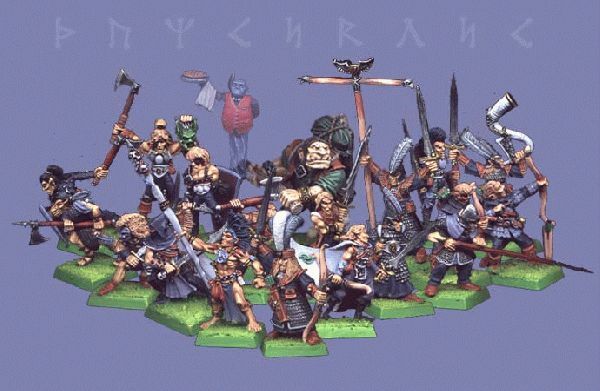 EXCELLENT LOOKING WARBAND of effette, pointy eared deviants! It's COOL to see some of the older Citadel minis in use; the War Dancer with the eye-patch brings back fond memories, AND the Ghostly Ral Partha waiter with the Pizza, NOW that is REALLY a trip down Memory Lane. VERYWELL DONE! I won't argue that the re-decorated models don't look better. There is something good still to say about the look of the models in the original 'green' shot, with perhaps the exception that a little static grass would have been a welcomed addition there. You've done a great job on these warriors chief. Great selection of miniatures. I like the vibe, I love elves. And there is a ghost floating in the background who is er, serving pie!? the left minitatur : it the old eltharion nice ! and yes it a nice warband but the creature in the middle whats THAT ? Gypsies? where is the gypsy warband?